The period Growth of the Church begins with the fall of the Western Roman Empire in A.D. 476 and ends with the East-West Schism in A.D. 1054. By G.K. Chesterton. Epic poem describes King Alfred’s battle against the invading Danes in 878. It is both a poetic tale of historical events and a timeless allegory about the ongoing battle between Christianity and the forces of nihilistic heathenism. Hardcover. Ages 16+. By Barbara Willard. Historical fiction set in the 9th century and seen through the eyes of Charlemagne's young son, Carl. Ages 10+. By Mary Fabyan Windeatt. Interestingly told story of the founder of the Benedictines and the father of Western monasticism. A great family read aloud. Ages 10+. By Barbara Willard. Historical fiction of the early days of Christianity in Great Britian. In 597 Pope Gregory sent Augustine to preach the Gospel to the Angles and the Saxons in the England of King Ethelbert. Ages 10+. An Usborne Starting Point History book. Why were people so afraid of the Vikings? Why were some of them buried in boats? What were Viking houses like? Were all the Vikings ruthless raiders? These are the kinds of questions you'll find answered here. Color illustrations. Grades 1 - 3. All the vitality of an ancient Viking settlement comes vividly to life in this colorful and educational sticker pciture book. 12" x 18" laminated backdrop and 46 reusable stickers bring the scene to life. Ages 5+. Usborne Illustrated World History series. 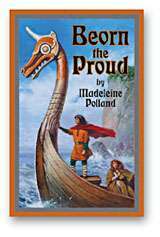 This book looks at the way the Vikings lived and captures their irrepressible spirit of adventure. It follows the voyages of such Viking explorers as Leif Ericsson. Packed with maps, charts and pictures, this is both a fascinating hiostorical chronicle and a valuable work of reference. Ages 10+. By Venerable Bede. Written in 731, Bede's work begins with the founding of the Church in England, describing political and religious struggles of the English people from Caesar's invasion in A.D. 55 all the way up to Bede's own time. Ages 16+. by Ingrid and Edgar D'Aulaire. Colorful, oversize picture book tells the story of Leif, son of Erik the Red, who sailed with his father from Norway to a new settlement in Greenland and when an adult, sailed from Greenland to discover Vinland (North America).